How is your week going? Since I worked a half of week last week~this week is a piece of cake for me, not like last Monday, which felt like it would never end, LOL! I am happy to report that Monday after work I went for my walk (My New Year Goal off to a great start), I even brought Josh's dog Kodi with me...let me just say~He walked me (that doggie is CRaZy and STRONG)!! I got quite a work out; and I had my new toning shoes on (which I wasn't sure if they would work or not; let me just say "they DO"), I couldn't go for my walk last night because my legs were killing me!! I guess that is a good thing right? I plan on going out again today~but without Kodi, LOL! I am also making progress on my new pantry, and it is almost photo ready. Our new can organizer boxes arrived on Monday and my sweet hubby put them all together for me last night. While I was stamping my thank you cards last Saturday, I remembered that I needed some "guy cards", which are always a little challenging for me. 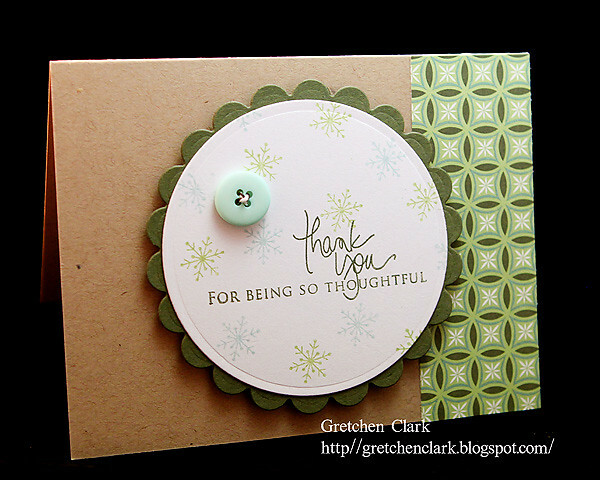 I used my new circle and Scalloped circle Nestabilities Dies (purchased with a gift card from a sweet friend), as a focal point, then just stamped some snowflakes on the circle and used a greeting from one of my favorite PTI sets Signature Greetings. I also used some retired SU! designer paper and retired cardstock. And I just had to add a button for fun!! Love this card and the CAS style!! Beautiful!